Miles Mason, Sr. JD, CPA, has authored The Forensic Accounting Deskbook: A Practical Guide to Financial Investigation and Analysis for Family Lawyers, an easy-to-follow introduction to the world of forensic accounting and managing divorce litigation involving complex financial assets. The Forensic Accounting Deskbook is published by the American Bar Association Family Law Section and is one of the ABA Family Law Section's best selling books. The American Bar Association has published The Forensic Accounting Deskbook: A Practical Guide to Financial Investigation and Analysis for Family Lawyers. Authored by Memphis divorce attorney, Miles Mason, Sr., JD, CPA, The Forensic Accounting Deskbook is an easy-to-follow introduction to the world of forensic accounting and managing divorce litigation involving complex assets. Written primarily for family lawyers, forensic accountants and individuals going through divorce can also learn how to recognize when an opposing spouse might be manipulating financial records and sharing misleading disclosures. In divorce, the opposing spouse's submission of false financial information can adversely affect a person's property division, child support, and alimony. Financial documents and accounting concepts are at the core of all asset identification, classification, and valuation, as well as income determination. The Forensic Accounting Deskbook connects the dots and fills gaps among the interrelated topics of written discovery, depositions, schemes to defraud, manipulation of company books, expert witness reports, forensic accounting methodology and techniques, financial statements, tax returns, stock options, pensions, and trial testimony. Forensic accountants will benefit from reading The Forensic Accounting Deskbook by adding depth of knowledge to why their services are needed, the procedural rules and discovery opportunities involved with their work, and how to better sell their services. The book informs family lawyers about the mechanics and details of direct and cross examination, professional standards, and ethics. These are all topics forensic accountants should know cold, but many don't. Included in the book are several sections of detailed sample questions and answers for the aspects of deposition and trial testimony that are common to many types of forensic accounting engagements. Individuals going through divorce may also find The Forensic Accounting Deskbook helpful because the book is written for lawyers who do not have expertise in finance and accounting. The book's central focus explains the roles performed by family lawyers and forensic accounting experts in litigation, as well as the process of litigating a divorce involving complex financial issues. A higher level of understanding of the financial aspects of divorce can only lead to making better decisions. From the beginning of the book all the way through to the very end, Miles makes it easy to understand the often complex subject matter he discusses, while at the same time making you aware of how much more there is to know. He then feeds it to you like spoon-feeding a baby. From the basic concepts and practical sample deposition questions to forensic accounting methodology and techniques, this book is a must-have for any practitioner of family law who handles cases involving contentious financial issues�and who doesn't? Miles Mason, Sr. JD, CPA, practices family law exclusively in Memphis, Tennessee with his firm, Miles Mason Family Law Group, PLC. He has presented many seminars at national and regional conferences on forensic accounting, business valuation, and divorce on topics including discovering hidden assets, reviewing financial statements and tax returns, and complex litigation. Mr. Mason is a member of the American, Tennessee, and Memphis Bar Associations' Family Law Sections, American Institute of Certified Public Accountants (AICPA), and Tennessee Society of CPA's. He serves the ABA Family Law Section as Liaison to the AICPA and is past chair of the Tennessee Bar Association Family Law Section. For more information about Miles and his firm, please visit MemphisDivorce.com. Miles has a way of making complicated and complex ideas easy to understand... I highly recommend this guidebook. 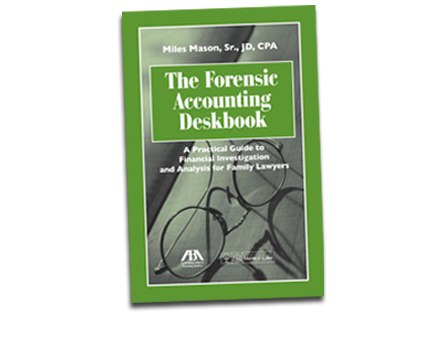 The Forensic Accounting Deskbook provides the concepts and detailed examples essential to both the novice and expert. Whether you've performed hundreds of engagements before or this is your first divorce engagement, you can quickly adopt the processes, use the checklists and create the financial analyses necessary to properly represent your client. It merges the world of forensic professionals with the practice of law! The Deskbook has already had a positive impact on my practice. Hands down the best book written to date on the topic of forensic accounting. It is so easy to read and understand. I've learned plenty of things to apply in my own work! See the Tracy L. Coenen's book review on her firm's blog, Book Review: The Forensic Accounting Deskbook. 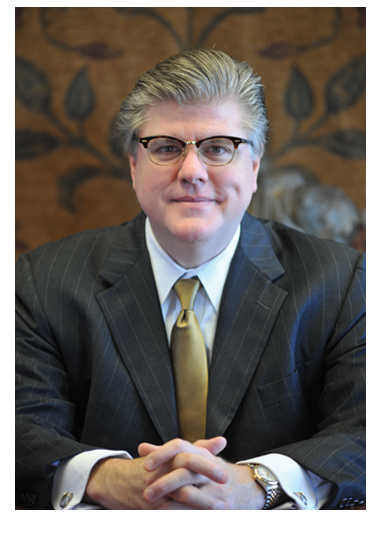 Miles Mason is a thought leader in the area of forensic accounting - primarily in family law. He has the expertise to lead the investigation to recover hidden assets and in addition, to uncover the forensic facts needed to get to the truth in terms of developing a fact-based statement of marital assets, liabilities, and net worth.